While working at my Mom’s house, I remembered that she has a book on the history of Leamington, Utah, and wondered if it might have information about Claybourne Elder. For those of you just joining us, Claybourne Montgomery Elder is my 3rd Great-Grandfather on my Father’s side. He was just a name in a giant list of ancestors, until I found out he was buried in the small town that my mom’s ancestors helped settle. I’ve been trying to find information about him ever since–but for some reason, forgot that people wrote things down in books. And that Mom has a large collection of books detailing family history, and history of the area. Anyway, I pulled out the Leamington book, and was thrilled to find a (albeit small) section on Claybourne Elder. Best of all, it is complete with a picture! 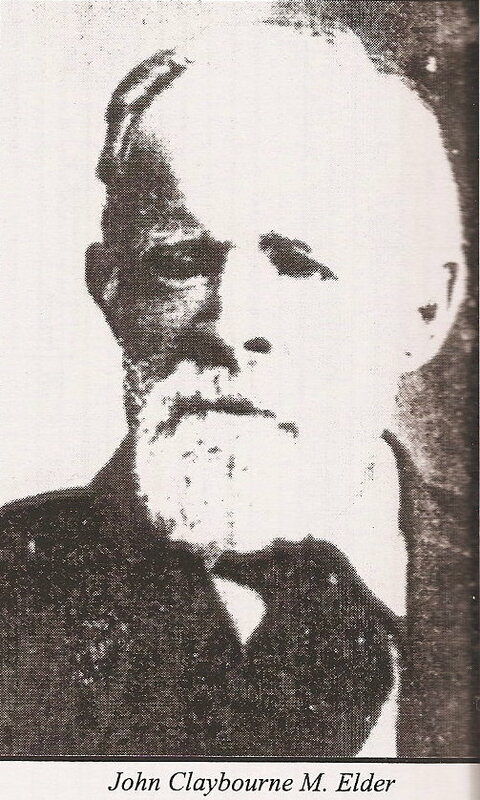 John Clayebourne M. Elder was the son of David Elder and Louise Montgomery. He was born June 2, 1827, in Bradford Tennessee. His brother and sister both died at a young age. His father also passed away, leaving he and his mother alone. His mother took Claybourne and moved to Nauvoo. He became acquainted with Joseph Smith, and they had many ball games together. He was well acquainted with the Prophet Joseph, and heard the shot that killed him. One day he and his friends were flying kites when the mob came looking for Joseph Smith. They asked the boys if they had seen him, and they said, “Yes, we saw Joseph and Hyrum going to heaven yesterday on a white horse, and they[sic] were sending them their supper in a baskets tied to their kites.” The mob left in discust [sic]. In 1850 at the age of 23, he crossed the plains with an ox team company, and upon his arrival in Utah, settled in Grantsville. He served through the Echo Canyon episode of the Indian War and also served in the Walker and Black Hawk Indian Wars. In Grantsville, he met and married Mary Caroline Pratt (random Cori note: my Grandmother) at the age of 31 in the year 1858. To this union, five children were born. In November 1860, he married Martinia Peterson of Denmark. To this union seven children were born. In 1862 he was called by Brigham Young to help quell the Indian disturbances in that section of the Territory. He had two wives and three children. In about 1863 he married Francis Elizabeth Pratt. She was Mary’s sister. She was 19 years younger than him. To this union, eleven children were born. A short time later he met and married Nancy Ott. She was a widow with one son, David. Claybourne moved 23 times in one year, and he said it was not a good time for moving either. In about 1873 while living in Dixie, (random Cori note: the south-west corner of Utah. Where my Dad’s family is from.) confusion developed, and Martina secured a divorce and took her children and left Dixie and went to Kingston, Utah and settled on a homestead. 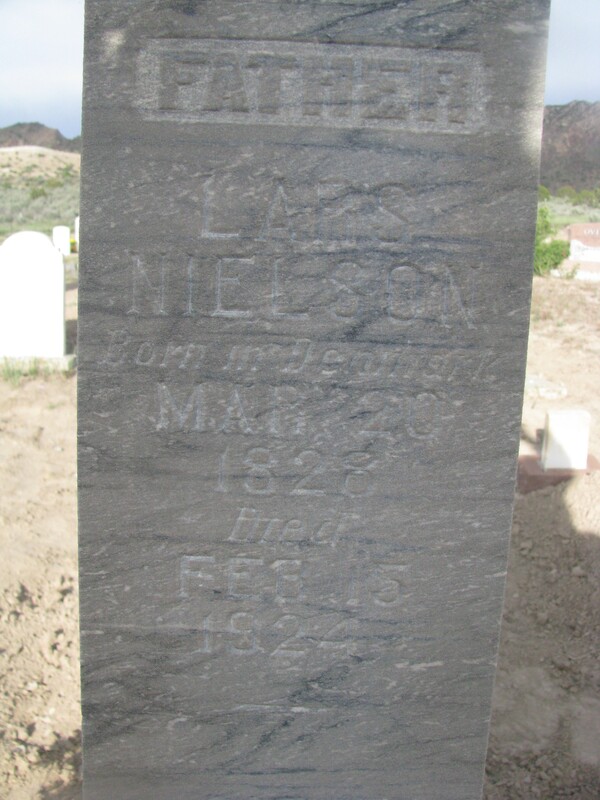 She dited in about 1912, and is buried in Junction, Utah. Claybourne stayed in St. George until 1888 where he sawed wood and lumber at his own saw mill. He sawed all the lumber for the St. George Temple. Claybourne then moved to Panguich where he lived for a while. He then moved to Hinkley and lived there for five years. 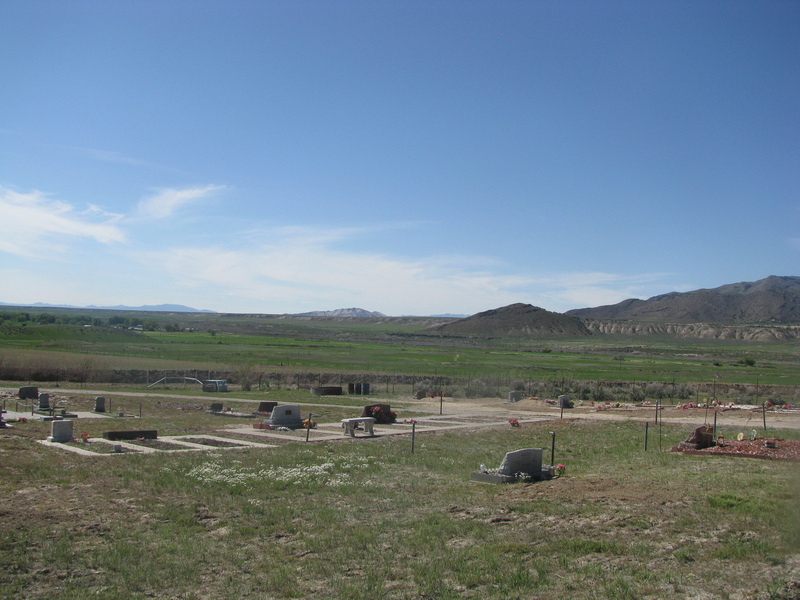 He then moved to Ferron, Emery Co., and lived there until he was 80 years old. (Random Cori note: This is where Mary Caroline died and is buried.) While in Ferron, he met and married a Mrs. Plusfer in 1908 at the age of 81. They didn’t live together very long. (Random Cori note: This was after 1890 Official Deceleration, in which the Church banned all new polygamous marriages. Claybourne had buried four of his wives, and was divorced from a fifth at the time he married Mrs. Plusfer.) He then went to Leamington and lived with his son Parley for the last three years of his life. He is buried in Leamington. Claybourne was a very good musician and really made the fiddle talk. He played for many a square dance in every community he lived in throughout his life. He joined the Church when he was 17 years old, and retained a living testimony of the truthfulness of the gospel. He always wore high top boots and a large hat. He was also an excellent carpenter. He helped build the prophet’s mansion, and he made the benches for the school house in Hinkley in 1878. He also helped build the school house there. He had 24 children in 28 years, his first being born in 1859 and the last in 1887. 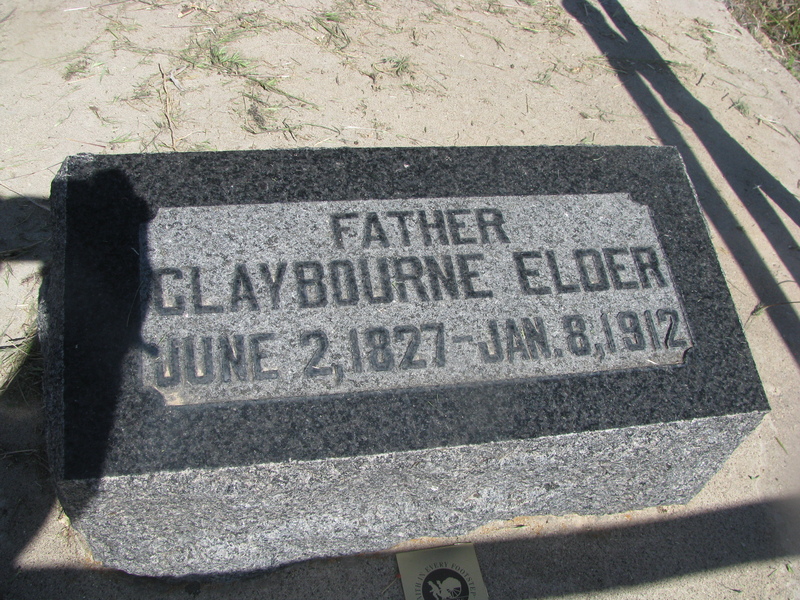 Claybourne passed away at the home of his son in Leamington, Millard County, on January 9, 1912. I don’t know who wrote this, or where they got their information. I’ve also found evidence of as many as three additional wives–a Nancy Ott, a Nancy Williams and a Nancy Williams Ferguson who weren’t mentioned in the article. Nancy Ott would have been his first wife. Which makes sense, 31 is really old for a Mormon man to be getting married for the first time in those days. Heck, 31 is still really old for a Mormon to be getting married for the first time. I’m happy to have found this, and a little dismayed that it took me as long as it did to you know, actually pull out that particular book and look for it. It’s good to get those reminders that the vast list of ancestors that other people have found and tied to my family tree are more than just names and dates. They lived and died, had joys and heartbreaks, and had interesting stories of their own to tell. I was thinking about it last night, and it kind of makes sense that my allergies are a) the worst I’ve had in years, and b) a couple of weeks behind schedule. We had a warm, wet winter followed by a cold spring. So while the grass (what I’m really allergic too) has grown prolifically, the cold spring delayed the growth. So, a dozen benadryl (not at the same time! )coupled with psudophrine to keep me awake, a hot shower, and enough Vicks VapoRub to knock out…an animal notorious for a poor sense of smell later, I’m actually feeling ready to rejoin the world of the living. I’m not sure how the stuffy ears fit into all of this, though. This is a Cache at the old Sinks Dance Hall. It was opened sometime around the end of World War I. 1919-1920. It was a place to go to Dance and have a drink or two. The Railroaders in Lynndyl Opened a Club so they could go to a private place to drink and party. It worked pretty well until around 1925 Shell Nielson got into a fight with one of the Railroaders, They had both been drinking. Shell took a swing at the guy and hit the potbellied stove and it knocked it over. He thought the guy was real solid. The stove tipped over and caught the place on fire and it burned to the ground. 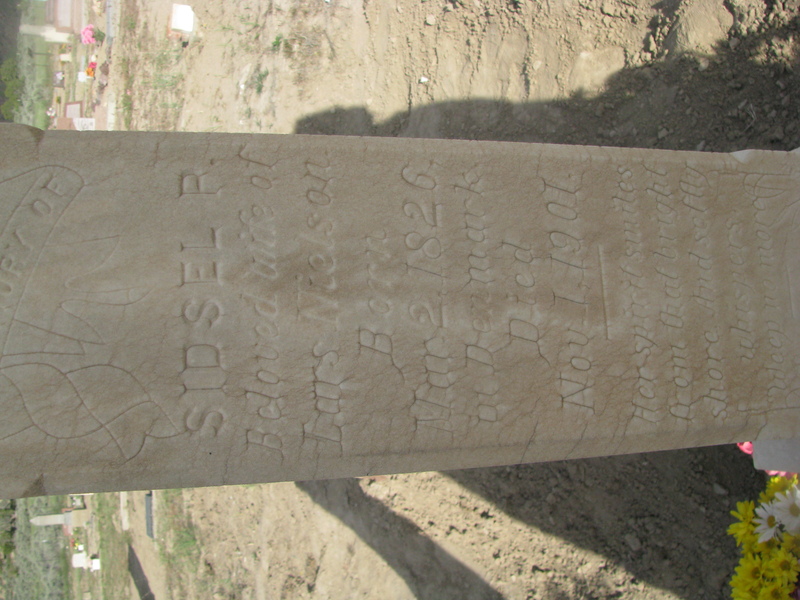 Shell Nielson is my great-grandfather. (The son of August, who needed dynamite to dig a grave before he was buried.) He died in the 60’s, so I never knew him, but from stories I’ve heard–not to mention various uncles and cousins that I do know, it seems perfectly in character for him. I’m choosing to imagine my very proper Great-Grandmother, who I did know, at the dance hall at the time of this incident, and how she would have reacted. It’s not pretty. Hilarious to observe from the safety of 85 years away, but still not pretty. I was chatting with my sister this morning, and she mentioned that she was going to take the kids to the aquarium, and asked if I wanted to join them. As I love my nephews AND the aquarium, not to mention the fact that E’s grown a tooth since the last time I’d seen him, I jumped at the chance. 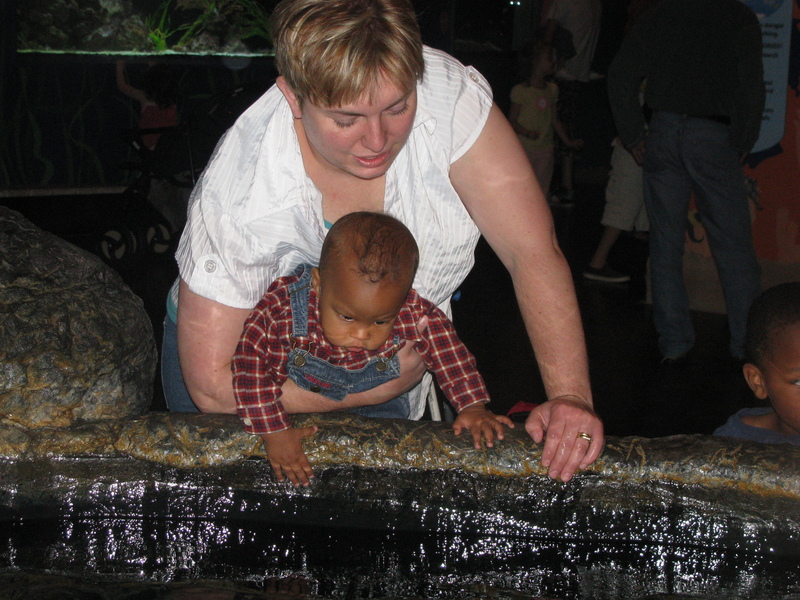 For the record, E LOVES the aquarium. He refused to stay nicely in his stroller, and would grin whenever he could be right up to the glass. He was even brave enough to touch the sting-ray, or probably more accurately, didn’t comprehend why it would be scary too. G loves the aquarium too, but it’s more a matter of being able to run around, and splash in the tide-pool exhibit (as long as the sting rays aren’t too close). While Sis was getting E’s stroller ready, G and I went in ahead, and promised Sis that we’d wait for her at a certain point. G got bored, and ran on ahead, with me following behind. The layout of the Living Planet Aquarium is such that the first two big exhibits you see are the jellyfish and the octopus. However, before the jellyfish exhibit there is a small tank that has a few eels in it. G LOVES those eels, and stopped to look at them. They were hiding under some of the rocks in the tank, so they took a little bit to find. The eels also share there tank with two yellow tangs. While G and I were looking at these eels, another family came up behind us. They glanced at the tank, and the mother tried to draw her son’s attention to it “Look at these fish!” she said, “They’re yellow!” The son didn’t respond, and they moved on. I wondered if they thought it was strange that they had just payed $9 a ticket*, and the first tropical tank they saw only had two fish you could by at any pet store. At this point, this mother was starting to get on my nerves. I was wondering if she payed attention to anything? Of course, I’m the kind of person who likes to study things in minutia. But still, you take you’re kids to the aquarium so they’ll learn something, while they think they’re having fun. 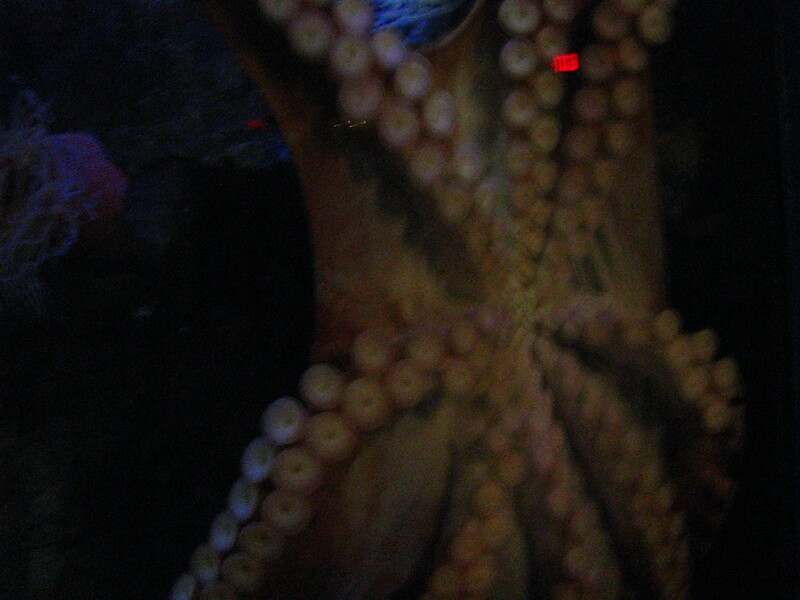 For me, anyway, the best way to learn something is by paying close attention to it–from figuring out why an aquarium would have two common fish in a largish tank, to paying attention when the education guide teaches why octopi are, well admittedly gross looking, but unbelievably cool. TLP doesn’t change their exhibits around that much–the animals are all too delicate to undergo that kind of stress, but every time I go, I see and learn something new. So, the point of the last thousand or so words is simply to remind everyone, but mostly myself, to pay attention. Of course, y’all are smart enough that you figured that out for yourself. *I’m all over The Living Planet, and I feel like I need to spread the word as far and wide as I can; a year pass costs only a couple of dollars more than two individual tickets. It’s a great deal, and if you go more than three times in a year then you’re money has been well spent. Today, at least in the United States, is Memorial Day. It’s a day that, in theory, anyway, is set aside to honor our dead, especially those who served in the military. In practice, it marks the first day of summer, a three day weekend, and barbecues. Lots and lots of barbecues. The Memorial Days of my memory involve getting up early and heading to the small cemetery to watch a ceremony honoring the veterans. At least, I think that’s what we were doing. Generally, my eyes would have swollen shut because of allergies before the day was over. Fortunately, through a combination of modern allergy medication, rye-cutting technology, and probably just plain growing out of the worst of my respiratory allergies (and into food allergies. Grrr.) I was able to visit the Leamington Cemetery twice this week, and still come out both breathing and seeing. I posted about the first visit already, but when I went again, I was dragging Sis and her family, as well as Dad along. We put flowers on the graves of both Claybourne Elder and my Great-Grandparents, then I wandered around to see who else I could find. To start, the graves of my great-great grandparents are right next to my great-grandparents. I always knew that, but had never thought about it. While we were there, my grandparents showed up to decorate my great-grandparent’s graves. Grandpa told the story about when his grandfather died. He was six years old, and remembered them bringing him up to the cemetery on a hay wagon. It was January, always the coldest time of the year, but that year was especially bad. The ground was so frozen they couldn’t dig a hole to bury him, so they used dynamite to blast the hole. Living in a small town totally rocks. Lars and Sidsel represent the most recent of my ancestors to emigrate to the United States. They were living in Denmark, with Lars’s brother and sister-in-law. The brother and S-I-L heard about a meeting where Mormon missionaries were going to speak, and they were curious. They asked Lars to come along. Lars agreed, because, as he puts it, he knew the bible, and he knew at the last days, there would be wolves in sheep’s clothing. He was going to expose the falseness of these Mormons. The brother and S-I-L were baptized Mormon after that first meeting. It took Lars two more. The story goes that after Lars was baptized, the preachers in Copenhagen hated to see him coming, because here was this Mormon tailor who knew the bible better than they did, and he could often confound them. This guy shows all the characteristics of the ornery side of the family–the ones who are descended from him. I thought the potential roommate didn’t show up, so I got frustrated and headed back down to my parent’s house, where I got a call wondering if I forgot the time. Apparently one of us did. I was expecting her at 2:30. I waited until 3:30. I don’t know what time she actually showed up. The work on the trailer is nearly finished–all that’s left is cosmetic. It looks wonderful–much better than even when my parents brought it home. I wish I could have done more to help. I spent the morning chasing E and G, and then got hit by a bad stomach bug, and spent the afternoon in the bathroom and laying down. I’m feeling better, but I still don’t feel well enough to brave a drive home. So off to bed tonight, then in the morning–well, we’ll see. So, my sister has a problem. Well, really, my parents have a problem. And if my sister and my parents have a problem, so do I. My parents bought a used camp trailer last year, and it was in pretty rough shape. It is now in worse shape for the winter, as my sister discovered as she came down yesterday to prepare it for the season. Bad enough that the roof and at least two walls will need to be replaced. 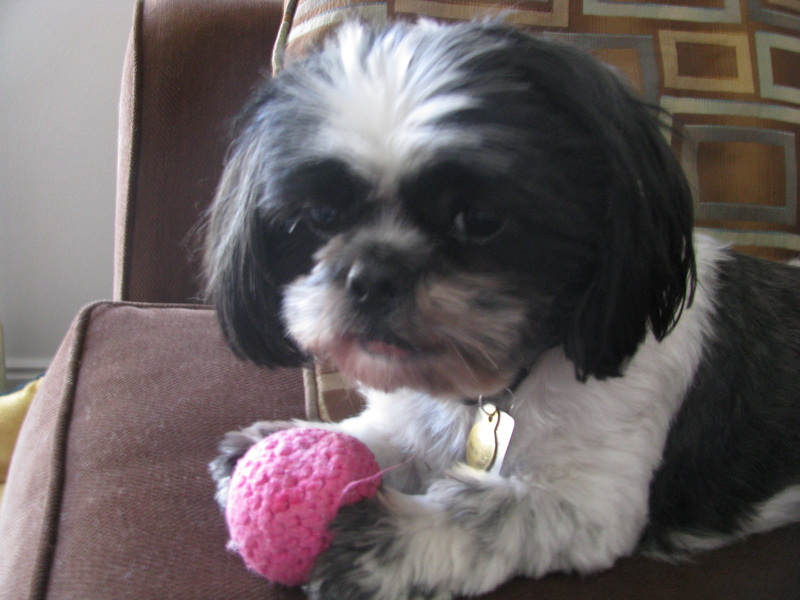 And, as I don’t have anything else to do at the moment, I was drafted into helping. I got to do deconstruction. I genuinely enjoyed the drive down. It probably had a lot to do with the fact that it’s now legal for me to drive my car, so I wasn’t as paranoid about cops, but I’m going to claim it had everything to do with the time of year. I spotted several largish patches of wildflowers–indian paintbrush and globe mallow. I could see meadowlarks singing their hearts out on fence posts, and saw perhaps a dozen hawks and eagles. I could smell the sagebrush, and the alfalfa that’s ready to cut, and the rye just starting to bloom. And then my nose stopped working and my eyes started to swell shut. Ahhh, spring. I came into town a different way than I usually, do, mostly because I wanted to stop and take pictures of wildflowers if I saw any more, and I had a car pass me, that I later passed, and I didn’t want it to see me stopped on the side of the road. Yeah, I’m insecure like that. I drove though what I consider my real home town, the place where I lived until I was 8. It’s been more than 20 years since we moved, but it still feels like home. So, here’s the thing. I know the Leamington cemetery. I know a lot of people who are buried in the Leamington cemetery. Heck, I’m related to perhaps half of them. But I’ve always known that. I’ve always known that my Mom’s ancestors settled the area, and I’m still related to at least a third of the population in and around this community. But that’s all my mom’s side. Clayborne Elder is–different, somehow. I found his grave, and discovered that it’s very well taken care of. There’s a fence around it, and the old sandstone headstone was replaced by a granite one at some point. The plaque underneath says he came across the plains. "Faith in every footstep", and whatnot. When I saw it, I started to cry. My roots in this area run deep. I always knew that they did, but when I was standing there, realizing that this was my family–from my paternal line, surrounded by maternal ancestors, I felt them go even deeper. It’s weird. I felt the family connection, and also the connection to place. This is where I belong, and I can’t imagine living anywhere else. Sacrament meeting was a little surreal today, I got the distinct impression of being told to work on my family history. I wish that such revelation would tell me where to start. Okay, so the opening hymn. It’s not one we sing often enough for me to have memorized, so I pulled out the hymnbook. I noticed that it was written by a fifth great-grandfather on my mother’s side. Interesting, I didn’t know he had a hymn in the hymnbook. Now, it’s not like I’m descended from WW Phelps or anything–I checked, and Edward Partridge (the grandfather on my mother’s side) has only the one hymn in the book, and Joel Hills Johnson (the grandfather on my father’s side) only has two. Did I mention that every single one of those individuals were/are Mormon? (at least for a bit. Some [okay, one] of them apostatized…) Family history is a big deal with Mormons, and we tend to have large families. What I’m driving at, is that I’ve had many faithful aunts and uncles (though I’m going to go out on a limb and say mostly aunts) who have plucked most of the low hanging fruit. While tracing my ancestry, most lines have been completed to the 1500s. I know I need to do this work, but starting in medieval Europe is more than a bit overwhelming.